October was upon us and life here was looking good. Lauren was settling into college , she gets a college bus and manages a 60 mile round trip by herself ! quite an amazing achievement for a girl used to a 3 mile commute with mum ..We were very proud of her and loved watching her enjoy her new independent steps. Andy’s diabetes was improving, his blood sugars were more stable and he has slowly started coming off some of his meds a wonderful endorsement of our new life. The diary for October was a diverse one to say the least and it starts off with a weigh in !The pigs were growing well and I was keen to weigh them, however scales for pigs are not cheap or that easy to find second hand. I had heard on my very fantastic smallholding course that you can calculate weight in other ways, so after a bit of research I set about using the tape measure method.. This is Edna measuring around about 30kg according to the math.. And no this isn’t a joke its a real and serious way to weigh your porker.. However the tape method is quite accurate and a lot more fun ..
Paula came to visit this month, and, as she’s a bit of a dynamo we put her straight to work in the garden ! P and I have created gardens in various places ,including schools and for the RHS so it was a nice change to set to, on my new back garden. We really got the berry patch re jig started and I hope to thin it out a bit more to open up a space for a new outdoor kitchen area next year ..it was great getting some of the garden into shape , she’s very driven .. even Lauren got inspired . with loppers and secateurs, and am glad to see Adam is taking after his dad on the pruning front ) All we to do was just feed them ..
Just in case you missed it before, Sarah was a whizz in the Kubota.. Thank you Fyfe gang we loved having you here..
Having lots of friends visit helps, but we were also developing new friendships all around us, and finding that we live in a very inclusive warm community. One of our neighbours (loose term really, they are about 4 miles away) have become really good friends and the support has been amazing .Being included in family gatherings is a privilege and really helps when you move such a long way from your support network. Actually they probably only like us for the massive marrows we kept growing 🙂 … The Wilsons up at ‘Lochenbreck’ have been amazing including us in local events, inviting us over for family gatherings , being co-conspirators in the machinery acquisitions and lots of other stuff that you don’t even realise.. Mum is also an amazing therapist keeping us all a lot calmer and more balanced.. A proper lovely bunch that we are really glad we moved near..
October is a month for getting the sheep ready for “tupping” that’s making sure the Ram is well fed , fit and healthy ready for his girls next month . The sheep, again need to be checked over for any signs of ill health , well fed , feet happy, all vaccinations, worm/fluke treatments and mineral drenches up to date. I learned a lot this month..
No, not an alternative bathing treatment; but a simple, and clever bit of science to make their cycles all coincide, so that they would all be “ready” for the Ram at the same time. Therefore hopefully give birth to their Lambs at the same time.. Very useful when you only have 4 sheep ! The girls have all been scanned now (end January) and we have 5 lambs on the way it seems .. Anyway it seems this new life is suiting us all, and since we don’t own a set of bathroom scales I decided to test the new pig scales by crawling in and low and behold according to the math I am a stone lighter !! but I feel I need to mention the walkers, ramblers and cyclists ..
or should I call them nutters ?!! 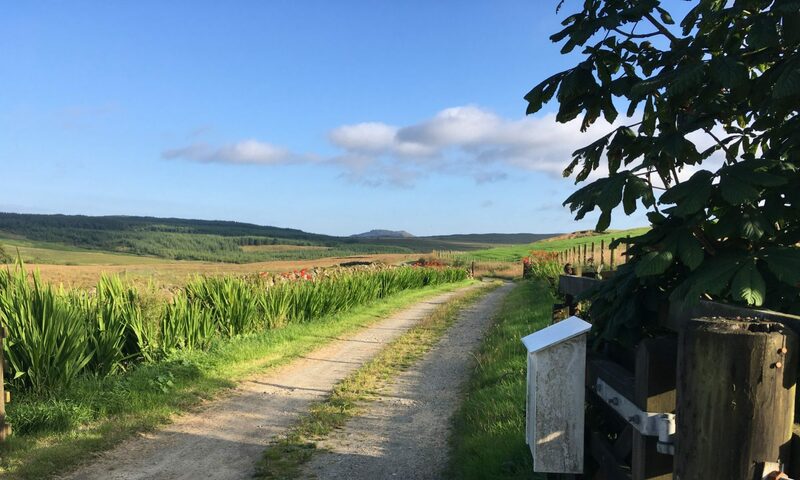 our farm sits on a public right of way , that’s kind of mad in itself since there is a “right to roam” here in Scotland that allows anyone to wander wherever they please.. We regularly see the above mentioned pass through and mostly without much more than a cheery wave . One day however I decided to ask a group of walkers ” where they, were actually going” because as far as we could see everyone was heading for a bog ! The group were really lovely and keen to show me their map, and walking plan, which I must admit looked quite plausible.. after which they headed of into the wilderness that is the land after our final wall. What you jealous about ? Previous PostPrevious Who ate all the pies !